Showing recent results 3541 - 3555 of 4490 products found. 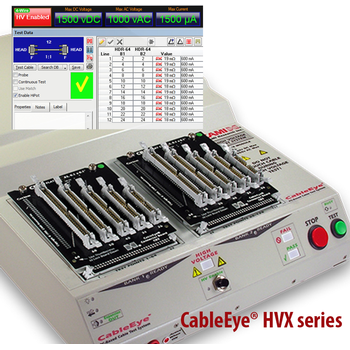 An add-on option for the CableEye HVX high voltage cable tester series that permits expanded testing for contact and wire resistance as low as 1 mΩ. After checking for opens, shorts, miswires, and resistance limits, the 4-wire Kelvin measurement applies a user-selectable test current from 10 mA to 1 A to determine connection resistance within 1 mΩ. The resistance profile of a model cable may be stored and used as a basis of comparison during later testing to reveal cold solder joints, faulty crimps, recessed pins, pin contact contamination, improper wire gauge, and stress-extruded wire.This option may be purchased with any new HVX tester, or added as an upgrade to any of your existing HVX testers. 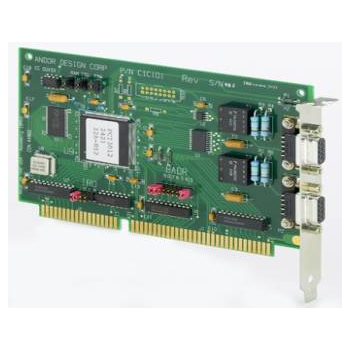 CIC101-4 - Andor Design Corp.
Price: Request QuoteMIL-STD-1553 A, B Simulator/Analyzer/Tester ISA BUS Interface Card. 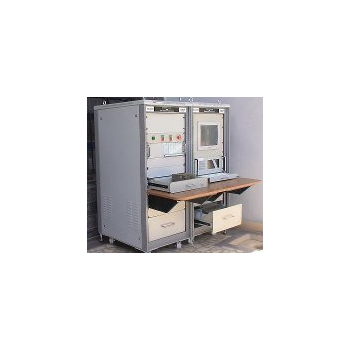 The CIC101 can be used for Validation Testing,Production Testing, full bus simulation and monitoring, as ageneral purpose 1553 interface or a stand alone bus Analyzer. It provides precise message scheduling andmeasurements. Major and minor frame times areindependent of message sequences or retransmissions onerrors. The start of all command messages may be set to beindependent of message length, response time or length ofresponse. The CIC101 features a calibrated Message timingand low jitter RT responses. 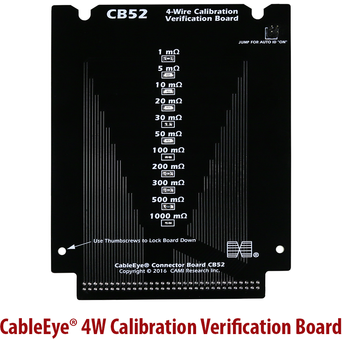 The CB52 is intended for periodic calibration verification of the Kelvin 4-wire resistance measurement module – an optional, add-on module that may be purchased with any new hipot system, or added to an existing high voltage tester as an upgrade. To ensure that 4-wire resistance measurements remain accurate, CAMI recommends running the verification check every quarter. 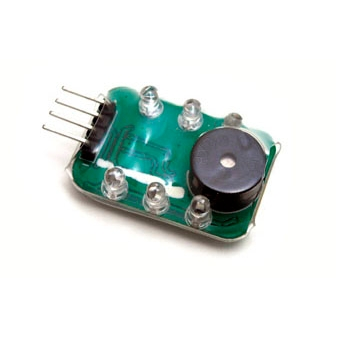 A 4-wire measurement module that is out of calibration will give inaccurate results. Some (maybe all) resistance measurements will be incorrect. Consequently, it may Pass what should Fail and, conversely, Fail what should Pass. In other words product yield will be contaminated due to unreliable measurements. 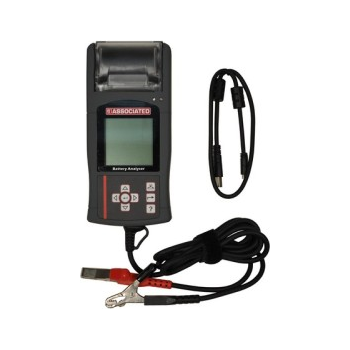 Extremely easy to use receptacle tester for use on 110~125VAC circuits. Just plug in to outlet and watch light patterns to detect faulty wiring in 3-wire receptacles. Shows open ground, open neutral, open hot, reverse and correct wiring. Check out this fast and super-easy pin-mapping process enabled by PinMap™. Map as fast as you can move the probe from one pin to the next. 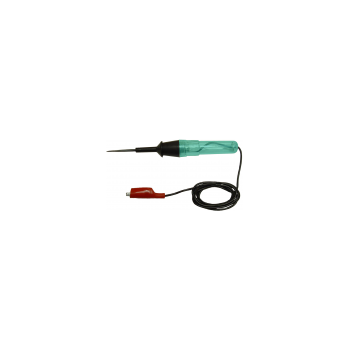 Use on your custom connectors, test fixtures, specially-built connector panels, or pigtail adapters to your CableEye tester. 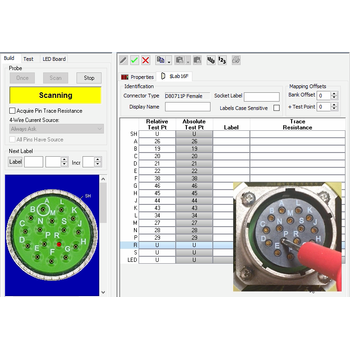 This software assigns test point numbers to connector types and applies standard pin designations to the pin numbers. 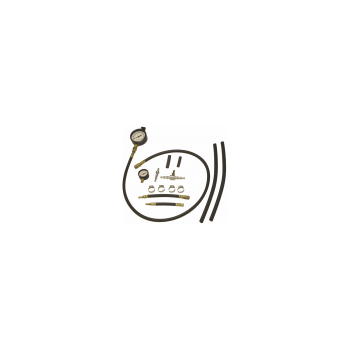 For each custom connector, first choose a connector graphic from our large library to match your connector. Then touch CableEye’s probe to the connector pins one-by-one to automatically detect and assign a test point to each pin. A synthetic voice reads probed pins as you touch them so you don’t need to take your eyes off the connector you’re probing. Finally, enter pin labels of your choice if you wish to override the standard designations. Checks AC and DC wiring up to 36 volts. 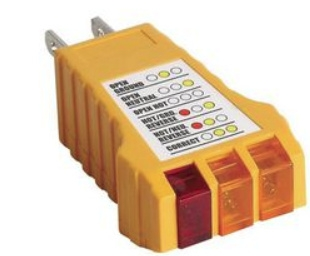 Use to check series-parallel switches and solenoids on tractor-trailer starter systems. An absolute must for the trucking, farm, heavy equipment and trailer industries. 48" ground wire. 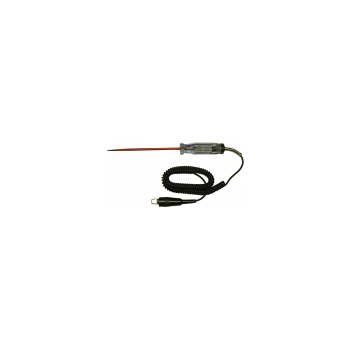 Features an extra long wire that stretches up to 12 feet for use, then automatically retracts. 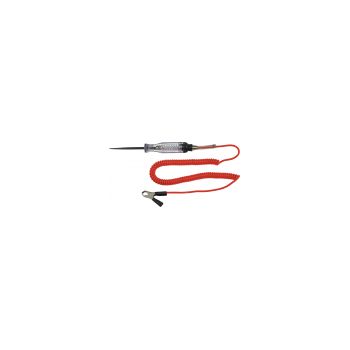 Quickly and easily check electrical circuits and accessories on 6 and 12 volt systems. Great for use on cars, trucks, boats, trailers, motorcycles, airplanes and snowmobiles. Heavy duty ground clip with insulator. 6 1/2" long, insulated probe. 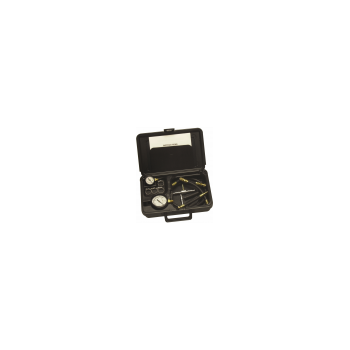 Tests gasoline fuel pump pressure on most domestic and imported fuel injection equipped vehicles.Quick couplers provide for fast and easy hook-up.Kit contains adapters to test all GM vehicles with Multi-port and some Throttle Body Injection (TBI). Tests all Chrysler cars with Multi-port turbos and some TBI.Use on most Ford TBI systems equipped with or without small Schrader test valve.Tests all Ford vehicles with Multi-port fuel injection systems. 12-1015 - Associated Equipment Corp.
Use to test electronic fuel injection signals, idle air control circuit and spark plug circuits. Quickly diagnose "no start" and engine miss conditions in the electrical fuel injection and spark plug circuits. Analyze rough running engines. 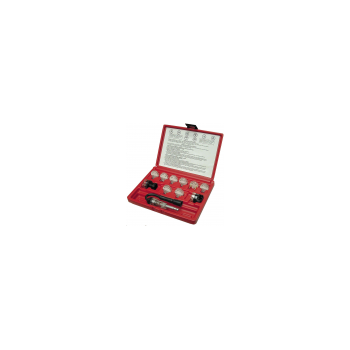 Includes 8 Noid Lights (for checking GM PFI, FORD TBI, GEO TBI, BOSCH PFI, GM TBI, GM SCPI, BOSCH 2 and GM Multec 2; 2 IAC Test Lights (for straight and 90 applications); and Cat. No. 23900, In-line Ignition Spark Checker. Verify the quality of copper pair or coaxial cable for analog and digital transmission up to 2MHz. 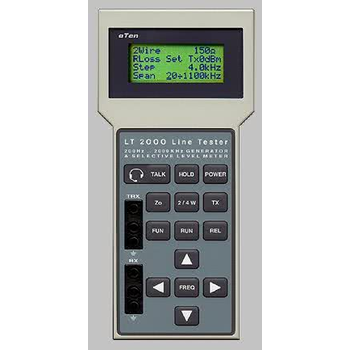 The LT2000 can perform the following measurements: NOISE – LEVEL - ATTENUATION - CROSSTALK - RETURN LOSS. For various transmission systems: Base band ISDN T1 E1 HDSL ADSL. This system is used to test COMED (Combined Map Electronic Display) IFU cards. This ATE checks the LRU Status and card status and identify faulty component in the individual UUT. On fault, this suggests the possible component failure as diagnostic report, for repairing the cards.